It’s the giving season, and University of Alberta Libraries is encouraging everyone to support young people in need. Between December 3 and 18, you have the opportunity to fill the socks adorning the holiday trees at the H.T. 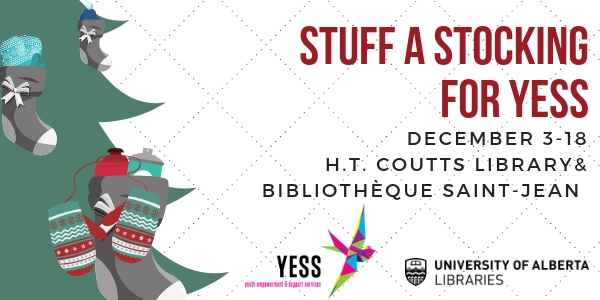 Coutts Library and Bibliothèque Saint-Jean with items for Youth Empowerment & Support Services (YESS). Visit YESS’ website for a complete list of items in need and for more information on how you can support them this holiday season. 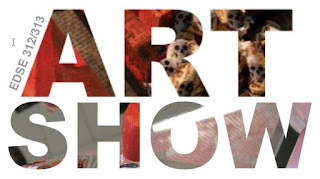 We are pleased to present an art installation prepared by the secondary education art students (EDSE 312/313) under the guidance of their instructor: Ron Wigglesworth. The students' ingenuity and creativity were challenged in these projects and the mixed media results are thought provoking. They were tasked to take a physical object making it represent an abstract idea infused with personal meaning. 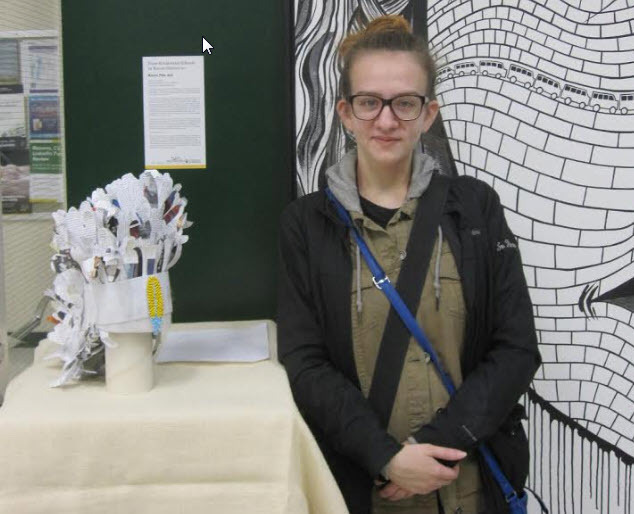 The students re-imagine, re-purpose and transform books to create multi-media art which addresses the students’ own experiences and represent social, political or ecological comment or shifts of ideas. Some students resisted changing or damaging the book and left it readable. This creative telling of the artists’ personal stories resulted in highly varied interpretations and iterations of work. We collect data on everything. Data is the new oil – a valuable resource of information used everywhere, from improving our quality of life to selling us things we don’t need. Can we bring those vast numbers to a human level? 1,000 paper feathers cut from a year book and a beaded feather. Intrigued? Visit Coutts Library over the next month to see more examples of amazing and thought provoking art by students in Education and Native Studies. A good night’s sleep is an important contributor to academic success, as well as our overall well-being. Yet, we’re often the architects of our own destruction: staying up an extra hour or four to get work done, texting or using other devices before bed or not maintaining a consistent sleep schedule. Breaking those habits is easier said than done, but thanks to a generous donation from the folks behind the Dream Big, Sleep Tight initiative, the John W. Scott Health Sciences Library has some new equipment available to help you get a good night’s sleep and give yourself a boost during energy lulls. 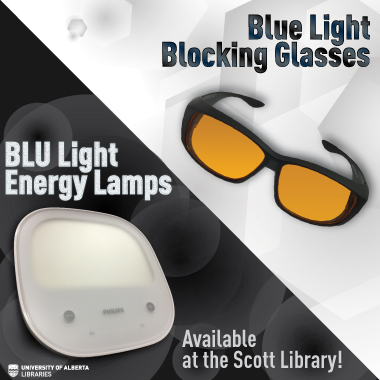 The Scott Library is lending out Blue Light Blocking Glasses and BLU Light Energy Lamps. Blue light, which is emitted by the sun and our digital devices, suppresses the sleep-promoting neurons in the brain and the body’s production of melatonin, the hormone that initiates drowsiness. When we use our digital devices within a couple hours of going to bed, these physiological processes are hindered and it becomes more difficult to fall asleep. By wearing blue light blocking glasses, you can use your devices within two to three hours of bed without sabotaging your sleep. The energy lights work the opposite way. If you have difficulty staying conscious in the morning or get groggy at midday, just 20-30 minutes with one of these lamps can help shake off the cobwebs and put you in an alert mindset. These lamps can also be used as a quick pick-me up if you’re feeling some of the effects of seasonal affective disorder (if this aspect appeals to you, we also lend out Light Therapy Lamps from a number of our campus libraries). Visit the service desk at the John W. Scott Health Sciences Library to borrow one of these phenomenal sleep tools. Both the lights and glasses can be borrowed for up-to three weeks at a time.